Market Effectiveness™ is about how well you service your marketplace and your customers. It includes how you create products and services, how you market, sell and service them and how you manage the product revenue lifecycle. Planning, measuring and managing market effectiveness is the most important activity in every enterprise. Market Effectiveness drives profitable growth. 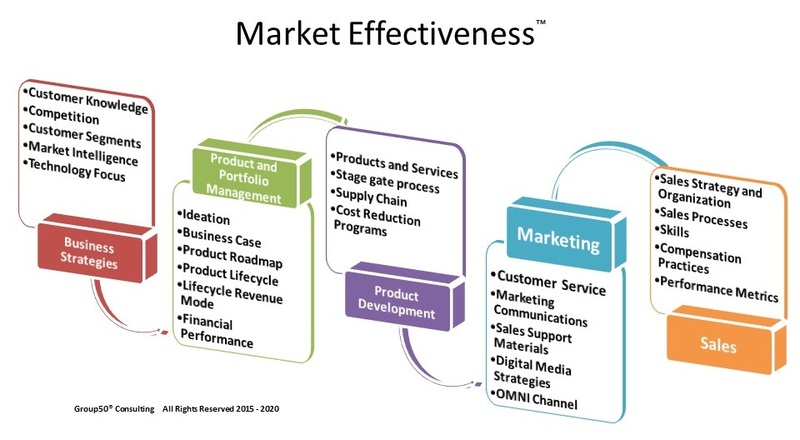 Companies with high scores for Market Effectiveness actively manage strategies and tactics for the processes shown below. Group50 offers a unique approach to identify and overcome the Market Effectiveness challenges that companies face. We know that both what you sell and where your products and services lie in the product life cycle drives the approaches to your markets and your customers. Introducing additional products and moving through the product life cycle revenue model (which most product managers don’t understand) demands a new perspective on product and portfolio management. It also demands a level of customer intimacy that most companies don’t have. Our consultants have the skills and experience to translate Market Effectiveness best practices into profitable and sustainable growth. We have worked with companies of all sizes across many different industries and know about Market Effectiveness approaches in companies such as GE, Black & Decker, Wal-Mart, Procter and Gamble, Rain Bird and many others. We understand Product Management, Product Development , new product introduction and the importance of an effective Sales and Operational Planning Process.